My travel in 2010 consisted of Buenos Aires, Patagonia, Uruguay, and New York City. For the upcoming year, I’m trying to make my way back to B.A. I fell in love with the people, the architecture and the face-sized steaks, and I can’t wait to get back. 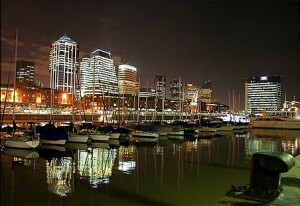 While there I hope to check out the Mendoza region and Montevideo, capital of Uruguay: the city on the sea. Travel Tips from Lessons Learned in 2010? If I were to offer up one tip, I would tell people to travel light. Whether it is luggage, in your walk, the way you talk or in your heart, a steadfast person is not as open to the flow of things. I learned that home is where my heart is and it beats in my chest. Predictions for Travel in 2011? Predictions? That’s always a hard one, but here it goes. I think Rio de Janeiro is going to have to wait for the World Cup to arrive to really take off, but I predict that the rest of Latin America (which is far cheaper to travel in) and Italy are going to boom (more so than already). Travelers are becoming more adventurous with their choices for places to travel in South America as more travelers visit. And there seems to a movement towards romance in the world, and where better could you find that than in Italy, and especially in Venice?Plus, given the popularity of the movie and the book, lots of people are going to want to see the sites from Eat, Pray and Love.